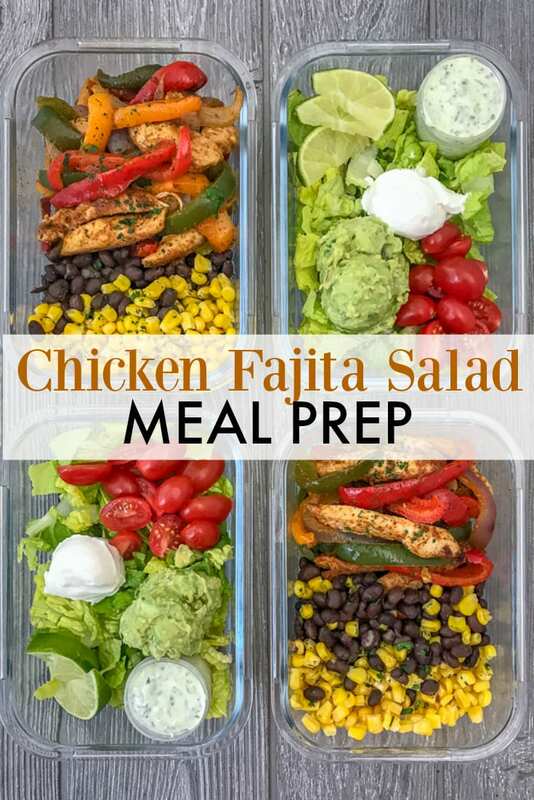 If you’re looking to change up your meal prep routine, then this Chicken Fajita Salad Meal Prep recipe is for you! Chicken breast, bell peppers, garlic, and onions – all tossed in olive oil and seasonings and roasted to perfection on one sheet pan. Easy to make, easy to prep for lunches or dinners, and a simple clean up. Both are lifesavers in my opinion. Sheet pan recipes, like Easy Sheet Pan Breakfast Potatoes, are wonderful because everything comes together and cooks on one pan – saving you the effort of washing any unnecessary pots, pans, or dishes. More often than not, the only other tools you need are a cutting board and knife. Maybe some mixing bowls. Ideal meal in my opinion. Especially when you’re meal prepping for the week. Prepping items for the week brings about many dirty pots and pans from cooking. Sheet pan meal prepping helps simplify that. Having your meals prepped ahead of time keeps you from standing in line on your lunch hours with the possibility of ordering something you know you shouldn’t. It is also more cost effective to create simple, healthy meals like this at homeCreate a sheet pan recipe that can be used as meal prep? Even better! Meal prepping takes enough time as it is on Sundays. Why use many more dishes than you have to in order to cook your meats and your veggies? With a sheet pan meal, the only dish you truly require is the pan itself. 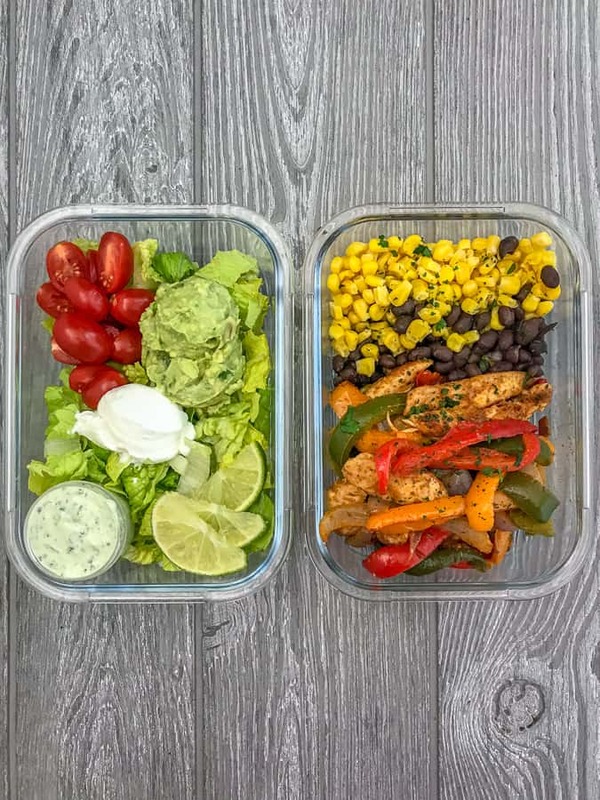 Bento Box Glass Meal Prep Containers – these are great for many reasons: they are reusable, eco-friendly, and good for keeping ingredients (wet and dry) from mingling together. If you want to keep your meats separate from your vegetables, fruit, or sauces – the dividers in a bento box work splendidly. Glass Meal Prep Containers – traditional, open compartment with no dividers that work well for a salad or single meal that needs heated up. 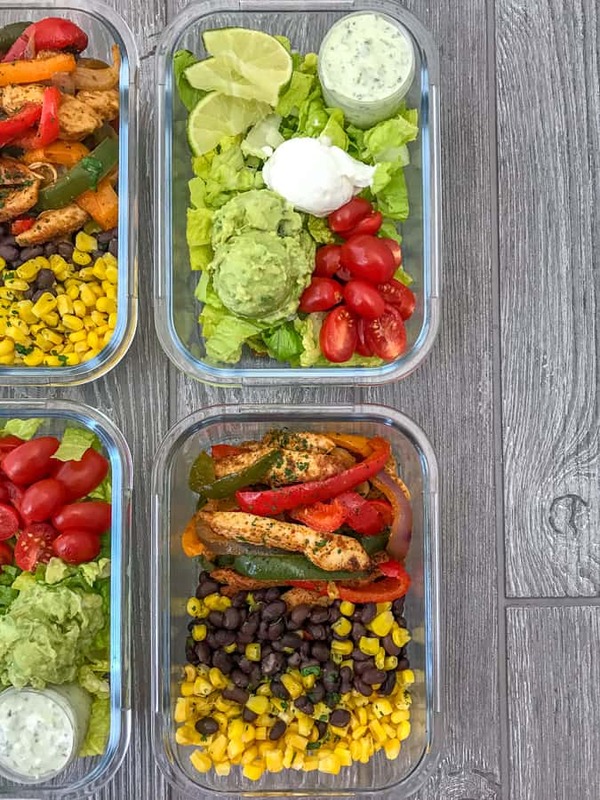 If you’re not a fan of handling or worrying about glass when leaving home, you could try these circular meal prep bowls or these single compartment containers – both are BPA-free, as well as microwave/dishwasher/freezer-safe. Salad Dressing Containers – work well for dressings, sauces, nuts, seeds, cheese, or herb garnishments. The options are endless and these are small enough that they work great for additional portion-controlling! Silicone Straws – not only are they reusable, but they are earth-friendly! They fit into a 30oz tumbler, are dishwasher safe, and they are bendable/flexible! Arctic Stainless Steel Tumbler – great for travel, for work and they keep hot beverages hot and cold beverages ice cold for a long time! Cutlery Set – great to pack in your lunch box or meal prep bag. They wash well and have their own case to keep them together. Sliced chicken breast, bell peppers, and onions that are all tossed together on a baking sheet with olive oil and spices. Baked in the oven until tender perfection. Served with a side salad, avocado mash, fresh lime juice and my favorite Creamy Cilantro Lime Sauce, making for a super delicious meal prep option! Preheat oven to 400 degrees F and line a baking sheet with parchment paper or spray with non-stick cooking spray. Combine the ingredients for the seasoning into a small mixing bowl and the olive oil and minced garlic into a separate small bowl/ramekin. Layer the chicken, peppers and onion strips onto the baking sheet making sure to create a single, evenly spaced layer. Drizzle the chicken mixture with the olive oil and minced garlic, tossing everything with a spatula to thoroughly coat. Season with the fajita seasoning mix. Roast for 20-25 minutes, stirring halfway through, until the chicken has reached an internal temperature of 165 degrees using a meat thermometer. In a small mixing bowl, combine the avocado, salt, and jalapeño. Squeeze the lime juice in, to taste, and mash with a fork until all ingredients are thoroughly mixed. 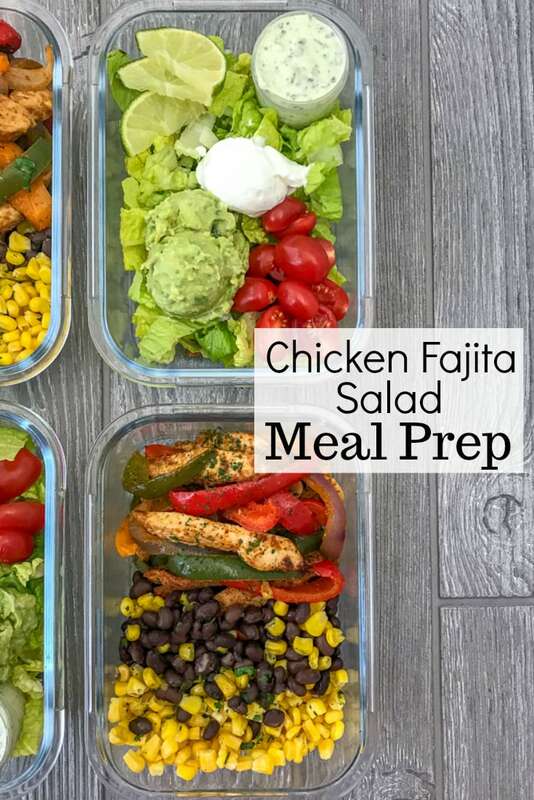 Divide the chicken fajita mixture, corn, and black beans among 4 meal prep containers. 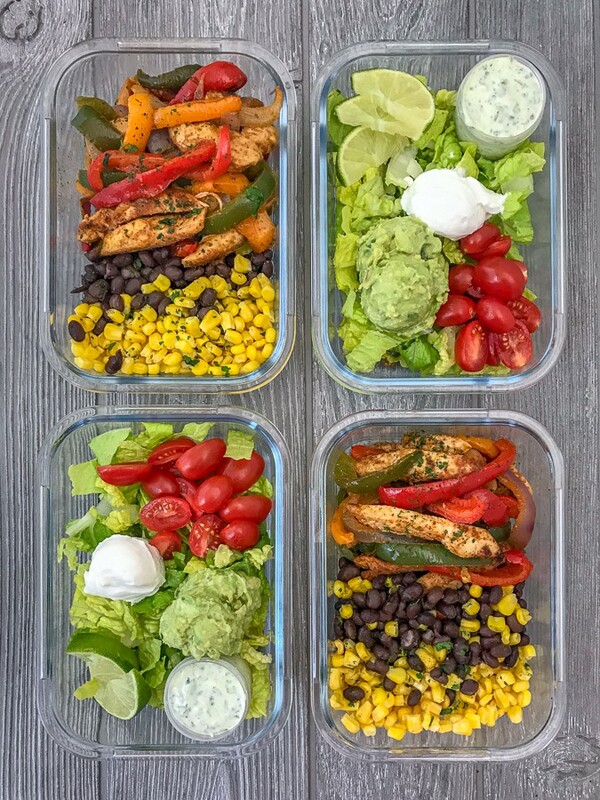 To 4 separate meal prep containers, combine the sides: chopped romaine, avocado mash, greek yogurt, cilantro lime sauce, tomatoes, and lime wedges. Keep refrigerated until ready to eat. Re-heat in microwave as needed.